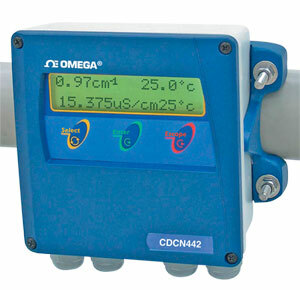 The CDCN442 toroidal conductivity system isdesigned for online monitoring of chemically aggressive process solutions, water applications that coat or foul traditional sensors, and plating bath operations in which high current densities are present. The sensor consists of 2 metallic ribbon coils that are fixed in place by the sensor jacket material. The drive coil is used to induce a current in the process solution. The second sensing coil is used to measure the current in the process solution; the magnitude of this current is proportional to the conductivity of the process solution. Toroidal sensors are available in polypropylene, and PEEK™ to ensure that sensor-wetted materials are chemically resistant to process chemicals. The sensor material is nonconductive, thereby isolating the sensor from electrical noise and ground loops that can influence the integrity of the measurement. This material also makes the sensor resistant to electrode coating, since most substances do not adhere to the sensor material. Sensors can be submersion mounted for easy installation in open tanks or pipe mounted in the optional 51 mm (2") tee fitting, which is keyed to the sensor for proper alignment. Tee fitting material is polypropylene. For larger pipe diameters, the sensor can be insertion mounted through a 11.2 NPT ball valve for easy retraction. The monitor comes with concentration/temperature tables for sodium hydroxide, potassium hydroxide, hydrochloric acid, nitric acid, and sulfuric acid. A configurable table allows the user to enter data points for a custom concentration curve. Typical applications include waste water treatment, power plants, thermo electric plants, pharmaceutical, photographic industries, soft drinks industries. 참고: Comes complete with hardware for 51 mm (2") tube installation, wall mount brackets, and operator's manual (sensor sold separately).